Mister Rogers arrives with an otoscope -- a tool used by doctors to look in the ears of their patients -- which belongs to a pediatrician friend. He talks a bit about the important task that doctors have of sharing information with others. Mister Rogers then sings I Like to Be Told. Visiting the office of his friend Dr. Jane Breck, Mister Rogers returns the otoscope and watches as a youngster receives a routine check-up. 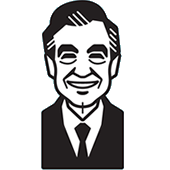 After the check-up, Mister Rogers returns to his house and talks about going to the doctor. He reminds viewers that doctors cannot use their equipment to know what a person is thinking and feeling. In the Neighborhood of Make-Believe, Cousin Mary Owl is asking eveyrone about their cousins as she plans a cousin reunion for anyone who is or has a cousin. Lady Aberlin and King Friday talk about the excitement surrounding the adoption of a baby by Betty Okonak Templeton and James Michael Jones. Lady Aberlin is heading to Southwood to see the baby again and King Friday gives her a gift to take with her -- a picture of himself. In Southwood, Dr. Bill is checking in on the baby as Lady Aberlin learns that the baby has been named "Carrie Dell." Back at the house, Mister Rogers talks about how important it is for babies to be loved. He concludes by singing You Are Special. Sure to answer any questions young minds may have, Mister Rogers asks the doctor, "When you look in somebody's eye, you can't tell what they're thinking can you?" As Cousin Mary Owl talks to Lady Aberlin about cousins, a lot is learned about King Friday's family. He has an older sister named Claire who is the mother of Lady Aberlin. He also has a younger brother named Paul who is the father of Nicky, Quentin, Polly, and Kevin. Including Prince Tuesday, Lady Aberlin has five cousins. Keith David mentions that Carrie Dell was named for members of Betty Okonak Templeton's family, James MIchael Jones' family, and his own family. This episode is featured on the VHS releases The Doctor, Your Friend and Going to the Doctor. Images from this episode appear in the Taking Good Care of You pamphlet Going to the Doctor. Special Thanks to Feick Brothers Co.